We've created numerous free resources to help you engage your people in compliance learning to address various areas of regulation. Select a category below to review our selection of training presentations, compliance aids, eBooks and expert videos. Free training presentation to help educate your employees on GDPR. The key points are delivered through a range of learning activities. Download Skillcast's Anti-Bribery Training Presentation to ensure your employees fully understand the laws surrounding bribery. This training presentation demonstrates a commitment to eradicating slavery across your business and supply chain. Your firm needs to be up to date on the Fourth Money Laundering Directive (4MLD). This training presentation will educate and infrom. Download Skillcast's free interactive training presentation to encourage good leadership skills in your organisation. Professionalism is crucial to success. Ensure your employees understand the importance of behaving professionally. Give your staff the gift of time by teaching them to optimise theirs more efficiently and effectively. This interactive presentation shows you how. This free PowerPoint presentation focuses on the law surrounding agreements between competitors and along the supply chain. 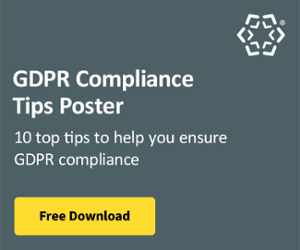 A free poster to display in your office to help ensure staff fully understand what constitutes and personal data and how to sufficiently protect it. Educate your staff on how to protect their identities against fraud and understand the different types of identity crime. An essential training presentation to help staff understand and identify the signs of stress in the workplace. A myth-busting attempt at explaining the key issues of whistleblowing and which circumstances are considered reasonable cause. The fast-paced, corporate world comes with new risks every day. This interactive presentation will help your staff manage risk confidently. Reduce your business' risk of falling victim to data security breaches and educate your employees on information security. Cybercrime is on the rise and organisations that aren't aware of its impact can be at risk of an attack. Avoid fines by educating staff on the key issues surrounding economic sanctions laws. Internal, employee fraud can be a real threat to companies. Take the steps to eradicate the risks, and educate your organisation. Safety must always come first. Your employees need proper training to be able to identify potential hazards and prevent accidents. If staff are aware of the signs of modern slavery, they can carry out their duty correctly if they suspect any wrongdoing. Maintain the health of your staff by educating them in the basics of Display Screen Equipment (DSE) use. This training template will help ensure your employees are aware of equality and diversity and put an end to discrimination in the workplace. A time-efficient way of ensuring staff are up to speed on the importance of equality in a healthy working environment. Educate your management team on the impact of equality and diversity on the working environment. GDPR - What Are Your Rights?